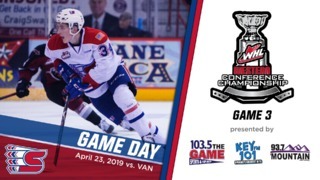 SPOKANE, Wash. – The Spokane Chiefs pulled out the victory in back-and-forth game against the Everett Silvertips on Friday night, snapping Everett’s nine-game winning streak. Carolina Hurricanes prospect Hudson Elynuik led the way offensively with two goals – including the game-winner – and an assist. Everett got the scoring started just under five minutes into play when Akash Bains cleaned up a rebound for his first goal of the season. The Chiefs responded with a goal of their own midway through the first, converting on the power play to tie it up. Defenseman Ty Smith found Zach Fischer all alone in the right circle, from which the Calgary Flames prospect snapped home his 14th goal of the year. The Silvertips regained the lead in the second, again striking roughly five minutes into the period before the Chiefs tied things back up on a Nolan Reid goal at 14:32. 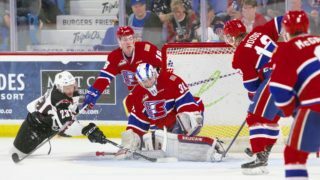 Spokane earned their first lead of the night later in the second as Jeff Faith clanged a point shot off the right post and in, beating goaltender Dustin Wolf to make it 3-2. Everett tied the game for the third time on the night early in the third period as Matt Fonteyne used his speed to break through the Chiefs defense on the power play, making a nice move to beat Chiefs netminder Donovan Buskey to score his 16th of the season. Hudson Elynuik reclaimed the lead for the Chiefs at the 12:47 mark, capitalizing on a beautiful tic-tac-toe play as Fischer fed Riley Woods from behind the net, Woods slid the puck across to the far post and Elynuik slammed it home. Elynuik scored his second of the night – and 17th of the season – into an empty net with 28 seconds left in regulation. The Chiefs finished 1-for-4 on the power plan and 2-for-4 on the penalty kill, outshooting the Silvertips 37-26. They are now 16-1-1 on the season when scoring 3+ goals. 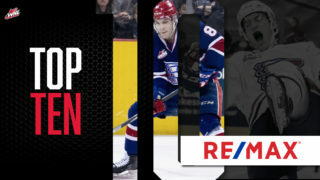 Elynuik’s big night pushed him into a tie for 16th among all WHL scorers with 44 points. 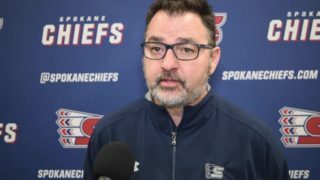 You can catch the Chiefs’ next home game Sunday, December 17 as they take on the Seattle Thunderbirds. It will Toys 4 Tots & Ugly Sweater Night, meaning Chiefs fans can be entered to win prizes throughout the night from courtesy of the Spokane Chiefs by bringing new, unwrapped toys donations for Toys 4 Tots. Additionally, Chiefs fans are encouraged to wear their favorite ugly holiday sweated to the game! 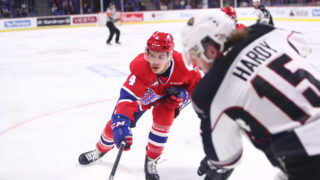 Tickets for Sunday night and all Chiefs home games are available in-person at the Chiefs’ Ticket Office, over the phone at 509-535-PUCK and online at spokanechiefs.com.